CD Project RED has promised to reveal a lot of new information about its upcoming action-RPG, but the only one news on the official site shows the concept-art of The Witcher 3 game. However, this picture looks really stunning. The Witcher 3 game will have two interesting peculiarities - immense gaming world and awesome graphics. We have already told you that to complete all main missions, you will spend about 50 hours, and the same time is needed to explore the huge game's map. 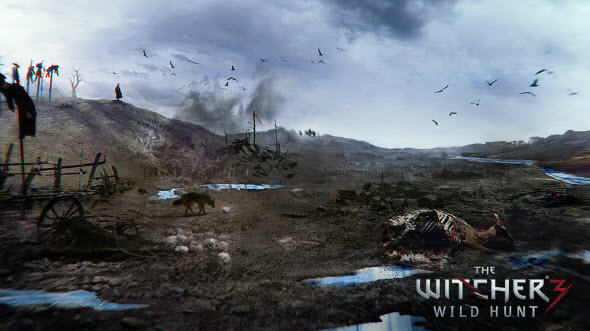 Now we would like to remind you that The Witcher 3 game will have a unique atmosphere and fantastic landscapes. To prove this fact the developers decided to show the newest concept-art from the game that is full of depression and melancholy. It is interesting that this concept-art looks really close to The Witcher 3 screenshots that is a sign of great designers' work. The Witcher 3: Wild Hunt will be released next year for PC, PS4 and Xbox One.